"I am loving being able to hear and loving my hearing aids. It has made my life so much better." Hearing is an important part of how we communicate and experience the world around us. Sounds like birds singing and the voices of the people we love bring so much joy to our lives. 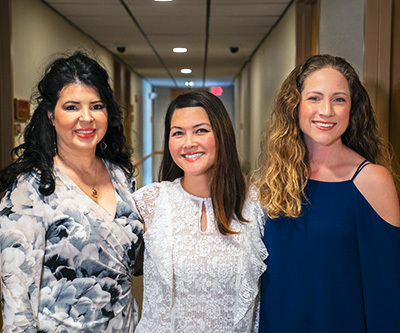 At Kendall Audiology, we are committed to helping out patients reconnect with these sounds through better hearing. Our team of licensed audiologists have dedicated their lives to finding solutions for every hearing loss, lifestyle and budget. For over 30 years, we've been known around the Miami area for our willingness to go above and beyond to take care of our patients. Our philosophy is simple: patient care is our top priority, always. We want to make absolutely sure our patients have a good experience. If our patients need something , we'll find a way to make it happen, whether it's supporting our patients in the aftermath of a hurricane or mailing hearing aid parts out of the country for our long-distance patients! We love we what we do: helping people and providing the highest quality of care for adults and children with hearing loss. It's the right thing to do, and it's how we've stayed in business for so many years, because our patients trust us and refer us to their friends. We've been around for more than 30 years. Generations of patients have trusted us with their hearing healthcare. We've built a reputation for excellent service and the highest level of care. We specialize in treating patients of all ages, including pediatric audiology. If you are looking for a pediatric audiologist in Miami, we have years of experience helping kids and their families on their path to better hearing. Our team of licensed audiologists bring diverse backgrounds and expertise. Because we work as a team, we're able to combine our specialties to best serve the needs of our patients. We can assist Spanish-speaking patients. One of our audiologists is completely fluent, and other members of our team are able to communicate well and/or provide translations. We have strong relationships with the medical community in Miami. Doctors refer patients to us because they know we'll do a good job, and we know some of the best healthcare providers in Miami and can partner with them to take care of your health. We work with patients who travel to Miami for their healthcare. Some of our patients visit us from outside the country. They choose us for their hearing needs because they can rely on us to take care of them even with tight schedules. First, you'll be greeted by our front desk staff. You can count on them to be smiling; we all love what we do here! If you have any questions, they'll take care of you. In our comfortable waiting room, you'll have an opportunity to fill out your intake paperwork. One of our audiologists will read through your paperwork and then bring you back to the testing room. Our audiologist will speak to you about your health history, why you've come to see us, what you're hoping to have help with, and what you've been having difficulty with. We'll complete a comprehensive exam and evaluation of your ears and your hearing. Depending on what we see, we may suggest additional testing to help us evaluate what might be wrong. We'll explain the results and what they mean and give you our diagnosis. We always explain everything and answer whatever questions you may have regarding your hearing. If we feel that hearing aids will help you, we will discuss product lines and cost and then make recommendations for you. We offer in-office demonstrations if you want to see for yourself what hearing aids are like, or for a reasonable fee we can allow you to bring a demo unit home to try hearing aids in your own spaces. You'll make a decision on your own time whether you want to move forward with hearing aids or not. We will never pressure you into anything.